Laparoscopic adjustable gastric banding (LAGB) is the least invasive form of bariatric surgery. It is increasingly performed on an outpatient basis. Malignant hyperthermia (MH) is a rare but life-threatening complication that can occur from administration of inhalation anesthetics. Desflurane is favored in bariatric surgery because of its facilitation of post-operative recovery. Here, we report a case of MH during LAGB, with Desflurane as the maintenance anesthetic agent. Review of the literature reveals one reported case of MH during LAGB. The use of anesthesia team familiar with the biochemical and metabolic derangements associated with MH will afford timely diagnosis and treatment of the disorder, thus reducing morbidity and potential mortality. A 32-year old woman with a BMI 41kg/m2, presented for bariatric consultation. Her past medical and surgical history included asthma, hyperlipidemia, infertility and arthroscopy performed under general anesthesia. Preoperative evaluation revealed no personal or family history of adverse reaction to anesthetics. The patient underwent LAGB. Anesthesia was induced with Propofol, Rocuronium and Fentanyl. Desflurane was used for maintenance. Towards the end of the laparoscopic portion of the operation, she experienced rapid physiologic changes consistent with MH. Her end tidal carbon dioxide (ETCo2) increased from 32 mm Hg to a peak of 115 mm Hg, pulse of 129 bpm and temperature increase from 35.8° C to 37.5° C. Her urine was color was “cola”-colored with a red-tinge. The volatile anesthetic was immediately discontinued and intravenous Dantrolene was initiated. She responded to the treatment, with a decrease ETCo2 (115 mm HG to 31 mm Hg) pulse (129 bpm to 80 bpm) and temperature (37.5°C to 36.0°C). The surgery was completed uneventfully with a total operative time of 63 minutes. CKMB and creatine kinase measured post-operatively were 84.2 ng/ml and 22,233 u/l respectively. Both CKMB and creatine kinase reached a maximum level on postoperative day one at 91.1ng/ml and 49220u/l, respectively. Post-operative management with intravenous Dantrolene continued for an additional 36 hours. The patient remained hemodynamically stable. All her metabolic and biochemical derangements progressively improved to normal values. She underwent physical therapy for mild muscle weakness. The patient was discharged home on post-operative day 8 in good condition. We present a rare but potentially life threatening intra-operative, anesthesia related complication of bariatric surgery. 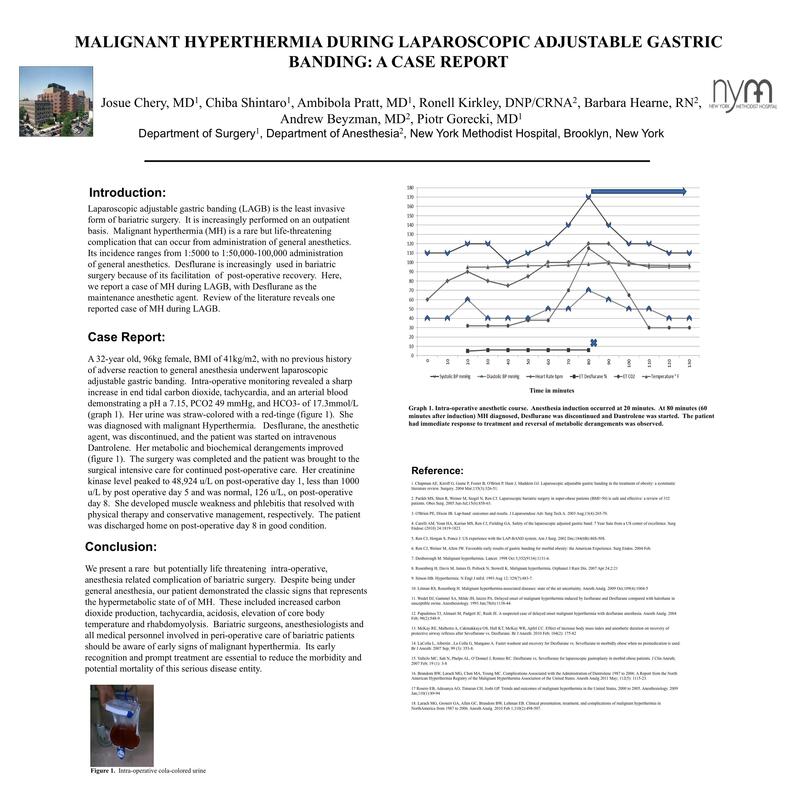 Bariatric surgeons, anesthesiologists and all medical personnel involved in peri-operative care of bariatric patients should be aware of early sings of malignant hyperthermia since its early recognition and prompt treatment reduce morbidity and potential mortality of this serious complication.